The following master list lets you launch control panel applets from the command line, run box, or Start Menu search on Windows PCs. The Windows Control Panel is an administrative interface that is part of all recent versions of Windows. It enables you to customize and manage different parts of the operating system, for instance devices, software, sound, the firewall, or user accounts. Microsoft began its move away from the Control Panel in Windows 8 when it introduced a new administrative hub called PC Settings. It continued down that path with the release of Windows 10 and the operating system's Settings application. Windows users have plenty of options to open the Control Panel, but they are usually less obvious on newer versions of Windows. What has not changed is the ability to open Control Panel applets directly on Windows (though some applets may have been removed). Date and Time timedate.cpl Opens the Date and Time applet. Allows you to set date and time, change time zone, add additional clocks, and sync Internet time. Display desk.cpl Display provides you with options to set display related settings such as the color profile or scaling. 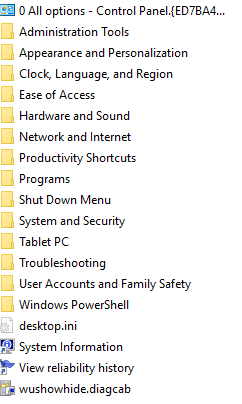 Loads the Settings app on Windows 10. Firewall firewall.cpl Opens the Windows Firewall. Turn it on or off, and open the advanced settings to block or allow connections. Infrared irprops.cpl Lets you manage infrared devices. Internet Options inetcpl.cpl Opens the classic Internet Options window. Manage Internet settings that Internet Explorer and other browsers may use. Keyboard main.cpl keyboard Change keyboard repeat delay and rate, cursor blink rate, and check installed keyboard hardware. Language control input.dll Opens the Language control panel applet. Add, remove or change the priority of languages. Mouse main.cpl The mouse controls enable you to change mouse icons, button behavior, wheel scrolling, and more. Network Connections ncpa.cpl Lists all known network connections and their status. Power powercfg.cpl Opens the Power Options. Set a power plan, and customize it. Screensaver control desk.cpl,screensaver,@screensaver Opens the Screensaver dialog to enable, disable and configure screensavers. Sound mmsys.cpl The Sound properties lists all playback and recording devices, options to configure those, and manage sounds and communications. System Properties sysdm.cpl System properties lists information about the device and Windows, and links to other control panel areas. Tablet PC tabletpc.cpl Only available if you run in tablet PC mode. Location Information telephon.cpl Set your country, area code, carrier code and dial number for telephony and modem services. User Accounts control userpasswords Opens the list of user accounts on the system. The command control /name Canonical Name enables you to run additional Control Panel applets for which no .cpl file are available. Note that some are limited to certain editions or versions of Windows. You can find out which Control Panel files (.cpl) are available on your version of Windows by going to c:\Windows\System32. There you find all that are available. You may open different tabs directly by adding ,x to the command, e.g. sysdm.cpl,4 to open the System Protection tab of the System Properties control panel applet. This works on the command prompt, but does not on Start or the Run Box. You can run applets with elevated privileges by starting them from an elevated command prompt. Hold down Ctrl and Shift on the keyboard when you launch the Command Prompt to do so. The canonical names used above may be used to reference these items in the Group Policy. How to run Control Panel tools by typing a command (applies to Windows 95 and Windows NT) -- Microsoft Technet. The guide lists the file names of Control Panel applets so that you may run these using Start, the Run Box, or the command prompt interface. or there is always GODMODE. does that still work on win10? Yes, God Mode still works in Windows 10. I have every control panel shortcut in toolbar folder. Can you take a look at Chocolatey – The package manager for Windows and its GUI?